Dr. Amy Vasquez (previously Rauf) wrapped packs for SOS and was an occasional extra set of hands during SOS clinics while she attended veterinary school at Cornell University. 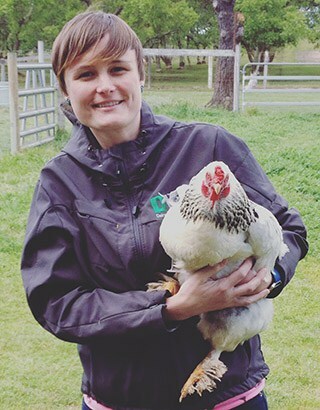 After spending 5 years as a dairy practitioner in the Central Valley California, she has returned to the area to pursue a Ph.D. in epidemiology. While she was “away,” she taught veterinary technician students at her local junior college, volunteered at Alley Cat Guardians spay and neuter program, and spent one day a week working at the Stanislaus County Animal Shelter performing examinations on intakes as well as spays/neuters on shelter animals and feral cats. She looks forward to continuing her surgeries as a veterinarian at SOS. Amy currently lives on 10 acres with her husband Joe, son Victor and their dogs and chickens. Over the next four years they hope to make it into their own little farm!